As the recession wanes on, beer sales continue to decline across all markets. According to the WSJ, recent sales of Bud Light, the No. 1 seller in America, have fallen 5.5%, while Heineken, the No. 9 brand, fell 15%. So rather than create a new product, the beer companies are just repackaging the same old stuff. To revive its Miller Lite brand, whose sales have recently fallen 7.5%, MillerCoors has begun testing a 1.5 gallon, $20 box of home draft. The box of beer stays fresh in the fridge for up to 30 days, and costs roughly 15% more per ounce than the same 18-pack of beer. According to Andy England, chief marketing officer at Miller Coors, told the Journal, "We're really trying to meet that occasion when you just got back from work and want to reward yourself," instead of beer for "the party occasion." 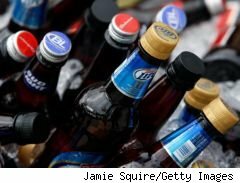 They're attempting to target the 30% of beer drinkers who prefer the taste of draft beer over bottled or canned beer. What's the problem here? This is Miller Lite we're talking about. The taste difference of a glass of Miller Lite poured from a bottle and that poured from a home tap is negligible. The 30% of beer drinkers who prefer the taste of tap beer might just have been talking about beers that actually taste like something besides water. Cheap beers like Pabst Blue Ribbon or Bud Light are best tasted straight out of the can or bottle. A home draft of Miller Lite is certainly not worth the added 15% price tag. Save the mini-keg or home tap for a real beer. Follow Ariston Anderson on Twitter here.